The brown pelican (Pelecanus occidentalis) is a small pelican found in the Americas. It is one of the best known and most prominent birds found in the coastal areas of the southern and western United States. It is one of only three pelican species found in the Western Hemisphere. 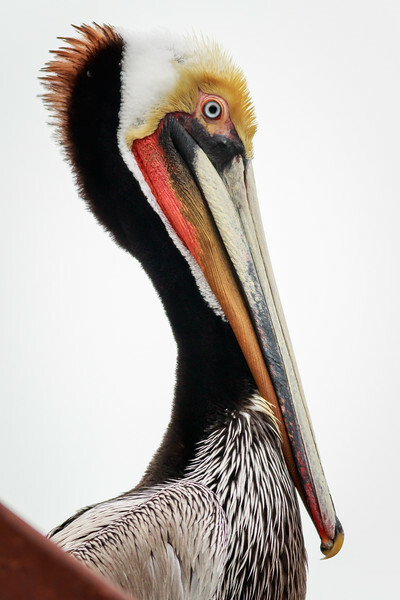 The brown pelican is one of the only two pelican species which feeds by diving into the water.The brown pelican is the smallest of the eight species of pelican, although it is a large bird in nearly every other regard. It is 106–137 cm (42–54 in) in length, weighs from 2.75 to 5.5 kg (6.1 to 12.1 lb) and has a wingspan from 1.83 to 2.5 m (6.0 to 8.2 ft). Through most of its range, the brown pelican is an unmistakable bird. Like all pelicans, this species has a very large bill, 28 to 34.8 cm (11.0 to 13.7 in) long in this case, with a gular pouch on the bottom for draining water when it scoops out prey. The head is white but often gets a yellowish wash in adult birds. The bill is grayish overall in most birds, though breeding birds become reddish on the underside of the throat. The back, rump, and tail are streaked with gray and dark brown, sometimes with a rusty hue. In adult pelicans, the breast and belly are a blackish-brown and the legs and feet are black. The juvenile is similar but has a brownish-gray neck and white underparts. This bird is readily distinguished from the American white pelican by its non-white plumage, smaller size and its habit of diving for fish from the air, as opposed to co-operative fishing from the surface. The Peruvian pelican, previously considered a subspecies of brown pelican, is now considered to be a separate species. It has very similar plumage to the brown, but it is noticeably larger. The brown and Peruvian pelicans may overlap in some areas along the Pacific coast of South America.